Considering education and control as a top priority, Karos explored interactions both inside the app and outside the app ecosystem. Karos is a real transportation startup, who've built a carpool app that leverages machine learning and big data technologies to transform empty car seats into a mass transit system. Karos has an intelligent assistant that optimizes people's daily commute by adapting to automatically find the people who share your route. Guaranteeing privacy is a big challenge for car-sharing services like Karos who bring together strangers: both as drivers and fellow passengers. Karos also faces issues in dealing with mobile phone flexibility. For example, Android phones have global settings ('my GPS is on') or local settings ('give this app access to my GPS') and it can be difficult for users to understand what is going on between the two. This deteriorates the Karos experience as some key features won't work without access to these local and global settings. The cross-functional Design Jam team challenged themselves to develop a user friendly control panel for people to manage settings and easily see when making changes may enhance or deteriorate the experience. If a person has their location turned off, Karos gives a friendly notification in the app that they'll need it turned 'on' to provide service. Touching 'Change privacy settings' links them directly through to where location can be turned 'on'. After changing the settings, an email is automatically sent to remind the person of the change allowing them to read the privacy details at a time, or on a screen, that is more convenient. By sending an email with simple language, and friendly and colourful illustrations, it makes the information easier to digest and act upon. Consent to use location, in this case, can easily be withdrawn in the future by clicking through on the links in email or returning to privacy settings in the app. By providing information by email and not just in the app, with links directly back to the privacy settings, builds trust because Karos is being transparent about data. People are more likely to give consent if they know that they can change their mind later. Karos provides an easily discoverable, single place for all data permissions. The purpose of any data collection is made transparent through clear and simple language, alongside illustrations. Explicitly linking data to concrete benefits, such as locating and picking people up faster, make it easy to understand and take control of privacy preferences. The settings are bundled into four distinct areas, with the ability to add new modules when the need arises, e.g. Sharing. The groups make it easy for people to find what they are looking for, to understand how changes may enhance or deteriorate their experience and take control of settings in a single switch. In the car – All controls related to locating a car for the person can be found here. 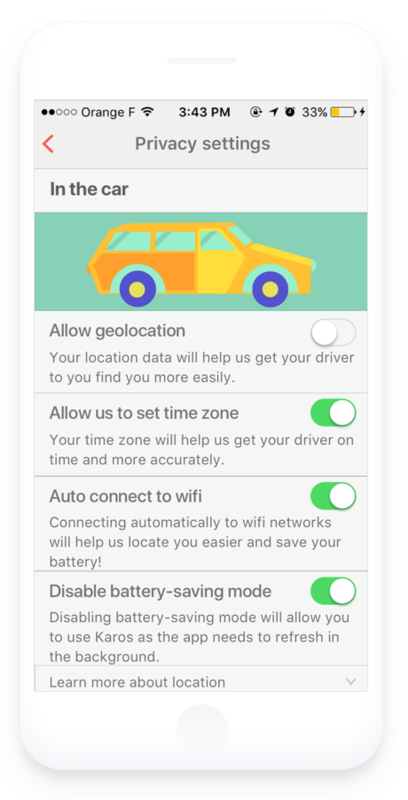 These include geolocation to help the driver find the person, timezones to ensure correct pickup times, and wifi to help with geolocation. Karos' team appreciated the Jam’s specific focus on the user. Consider what other formats and times we could be providing people with more information, outside apps and services? Explore modular privacy settings, especially when the number of groupings becomes large?